The Dispermat® CV product line offers the most capability for your laboratory dispersing requirements. 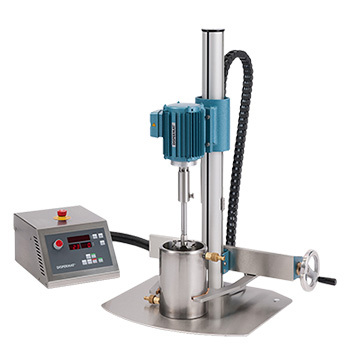 Mill base quantities from less than 1 pint up to 2.5 gallons (10 liters) can be dispersed. 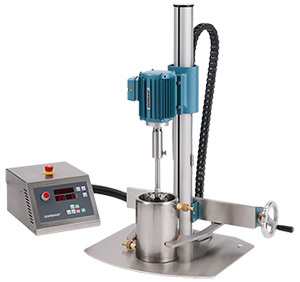 The CV models have a flexible design that can be converted by accessory options to perform media milling, dispersing under vacuum, or homogenization by a rotor-stator. The most current safety device features can be added to the CV models to maximize a safe operating environment. The Dispermat CV panel displays the important dispersion parameters for a consistent result. The CDS accessory is a vacuum system that prevents air entrapment during the dispersion process. Available upon request. The Dispermat® LC Series offers an economical design for small laboratory volumes to pilot plant volumes up to 10 gallon capacity. The motor design provides a quiet, low maintenance operation. A temperature sensor with automatic shutdown prevents the motor from over-heating. 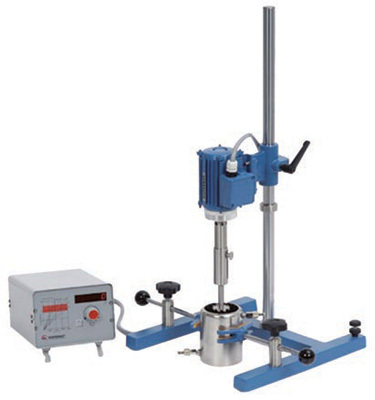 The Dispermat® LC stand comes with a heavy-duty clamping system to firmly hold the container. The larger Dispermat® LC models have a safety stand that comply with the European machine law standard. The Dispermat design can accommodate accessories that can convert the LC model to a media mill or a vacuum dispersing system. 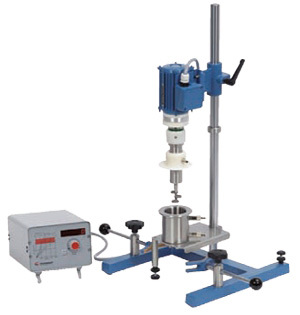 *Product volumes are based on mil base viscosity below 3,000 centipoise. 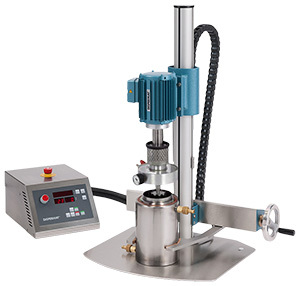 Dispermat® CN is a Dissolver with the electronics Built into the Motor - no separate power box. The dispersion CN is designed to give you maximum performance at a low price. 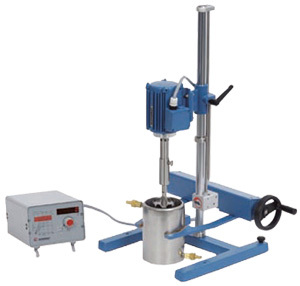 It is an excellent dissolver for dispersing small to medium size quantities of varying viscosities. Compact drive unit contains the strong 3-phase motor along with a separately driven low noise ventilation system - you hardly know it is running. * Standard 3-phase voltage is 400 VAC/50/60 Hz, any other voltage is available on request. 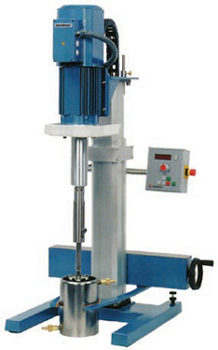 Dispermat, Safety device, Central clamping system, SS telescopic shaft protection pipe, 2 safety limit switches, Impeller, Operating instructions. In the laboratory and pilot plant it is often necessary to process material at defined temperatures; for example during dispersing, stirring and exothermic reactions it is often preferable to remove excess heat. Other applications may require heat to be added. 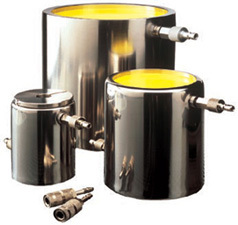 The high-quality double wall temperature control containers are ideal for these and other applications. They are available in many sizes and models. The stainless steel containers can be cleaned very easily due to their polished surface. The containers up to 5000 ml have self-sealing quick connect/disconnect fittings (ordered separately MX-B1257, MX-B1258 or MX-B1277) guaranteeing easy handling and time saving cleaning. Self-Sealing valves on the coupling and hose prevent leakage. The 10 to 65 liters double wall containers are equipped with standard hose fittings to enable heating or cooling. Stainless steel covers or split covers are available for all containers. Stainless steel, with tooth profile, w/5mm hole and thumb screw. Sizes Avail: 70, 80, 90, 100, 125 & 150 mm Ø 250 mm with thread hub & female. *Single wall containers and additional accssories available. Depending on application. Please call for pricing. Ask about other Dispermat products.